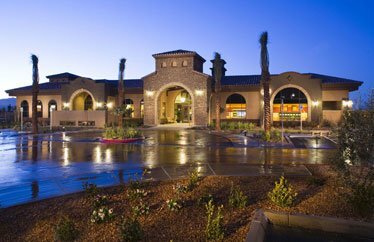 In the South Las Vegas Valley, south of Sun City Anthem bordering and overlooking the Sloan Conservation Area, the guard-gated Pulte homes of The Club at Madeira Canyon enjoy 24-hour security with their extraordinary views of the canyons, Black Mountains and lights of the Las Vegas Strip. At 2700-foot elevation, these Pulte homes enjoy the highest altitude of Del Webb communities. The new development home sizes range from around 2096 to approximately 4817 square feet with flexible single story or two-story floor plans. The Club at Madeira offers multipurpose rooms for kids and teens, boardrooms, basketball and tennis courts, massage center, fitness facilities and personal trainers, out door pool and hot tub, and walking trails. The Dell Webb master planned Madeira Canyon community next door has planned parks, walking trails, and planned elementary school. Enjoy Red Rock Canyon and surroundings or a day of boating on beautiful Lake Mead. Retail therapy is just a short drive from several major shopping venues including the Galleria Mall and The District at Green Valley Ranch. Remember to bring a buyers agent when considering new home development property.